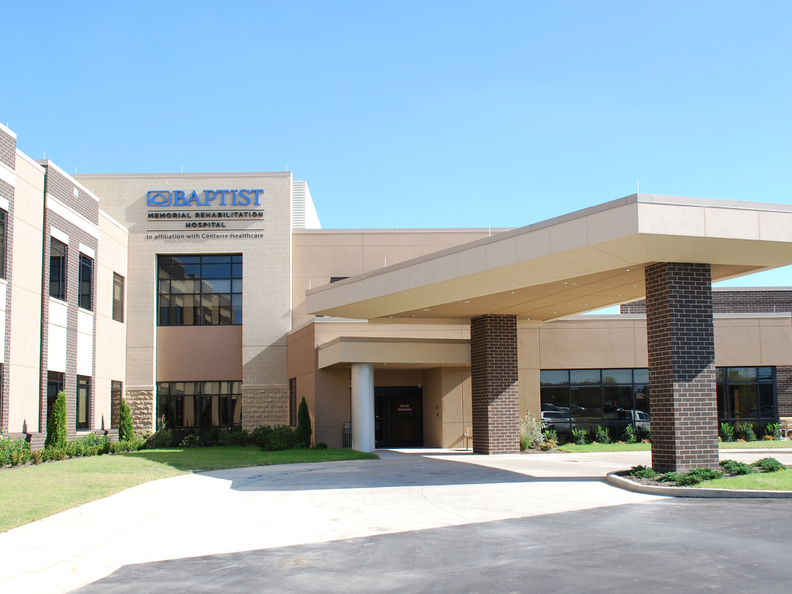 While Baptist Memorial Health Care owns the land that its 49-bed rehabilitation hospital sits on in Germantown, Tenn., it rents the facility from commercial real estate developer Duke Realty Corp.
Duke paid for the $33 million construction cost, freeing up capital for Baptist to spend on equipment, physicians and other investments aimed at improving care. Baptist also operates the hospital in a joint venture with Kindred Healthcare, which specializes in post-acute care. "It allows us to allocate our capital dollars to provide the maximum benefit to the patient," said Jason Little, president and CEO of Memphis, Tenn.-based Baptist Memorial Health Care. There has been an evolution in real estate management over the past 20 years, Little said. Health systems would typically own an asset like a physician office building and it would collect rent from the doctors. In doing so, it would take on the full risk for any vacancies and the cost of maintenance and upgrades. "Over time, we learned that there was a better way," he said. "It continued to evolve where we weren't just paying a real estate company to collect the rent and do the maintenance, but we were partnering in a joint venture to form an arrangement that best allocated our capital and fit our strengths." Part of that evolution involved managing Baptist's real estate collectively rather than in silos, Little added. Real estate property is often an overlooked asset in healthcare. But if health systems act like real estate investors, they could free up a significant amount of capital and design more efficient delivery systems, according to a new white paper from the commercial real estate firm CBRE. The healthcare real estate market consists of an estimated $1.5 trillion in assets, and health systems own $1 trillion of that. Real estate occupancy accounts for 8% to 12% of hospital costs. Notably, inpatient facilities represent more than 42% of all healthcare real estate in the U.S., while outpatient facilitiesâmany of which are hospital-affiliatedâmake up 27%. Thirty-four of the top 50 owners of healthcare real estate are health systems, which collectively own $227 billionâmuch more than all healthcare real estate investment trusts combined. Outsourcing property management of a building can reduce facility costs by 10% to 12%, while the provider can gain real estate expertise and enhance the property's value and operating performance, according to the CBRE white paper. Although many executives are hesitant to cede control, health systems can also sell the facility to an investor and lease back the space, or set aside part of the building for commercial development. For example, Parkland Health & Hospital System in the Dallas area recently sold its Parkland Memorial Hospital campus for $83 million. Developer Dreien Opportunity Partners plans to turn the property into offices, shops, a hotel and apartments. Providers typically target labor, supply chain and administrative tasks to cut costs as they cope with lower reimbursement levels, softening volumes, late payment and higher drug expenses. But health systems should recognize real estate as a distinct cost center that offers opportunities for savings on par with drugs, products, suppliers and even professional fees, said Jim Hayden, executive managing director of CBRE Healthcare. "Most of the C-suite level healthcare executives I talk to say they could do a better job at optimizing real estate portfolioâsomething they never think about because they are pulled in so many directions," he said. "If I am worried about the value of my house, why wouldn't I be looking at what my real estate value is and how I improve it?" Hayden likened the transition to the financial services industry. Twenty-five years ago, most banks owned their branches and other assets. But as the industry consolidated, bank executives realized that they were better off selling those buildings and leveraging their positions as major tenants to get certain concessions and redeploy capital into technology, he said. "You could see something similar to that in healthcare," Hayden said. "At some point, the economics are going to be such that there is more value in their real estate that would exceed any nonprofit concessions they would get." To think like real estate investors, health systems should first calculate the total cost of operating and managing their property. Then they should factor location, real estate demographics, parking, how the use of properties will change over time, and benchmark costs with other private-sector property management facilities, according to the paper. These considerations can help providers accommodate more accessible outpatient care settings and repurpose structures to get the most value. Trends to watch include real estate investment trusts' investing patterns. REITs have shifted out of investments in skilled-nursing facilities, while investment in medical office space and other outpatient facilities, private-pay senior housing and life science are becoming increasingly competitive because they are seemingly less susceptible to changes in government reimbursement and regulations. One example is Ventas' $1.75 billion investment in Ardent Health Services' real estate and hospital operations and a 9.9% stake in the company itself. A health system can also form its own REIT, in which it could retain significant ownership through its charitable foundation. But it's important to avoid conflicts of interest and any appearance of self-dealing, according to the white paper. "You have to think outside of the box," said Chris Bodnar, vice chairman of capital markets at CBRE. Baptist has also partnered with real estate companies to retrofit buildings, Little said. The real estate company would accept the downside risk if the health system didn't save money over the long-term with decreased energy costs, or other potential benefits. A shared-risk model also ensures that the building is managed, maintained and staffed adequately to ensure there is a return on investment, Little said. Those types of partnerships also help on the administrative side as the industry adapts to new regulations, he said. "When we look at day-to-day maintenance, financing and operations of our buildings in a more holistic way, we find real economies of scale," Little said. An edited version of this story can also be found in Modern Healthcare's April 9 print edition.